A red based fruity burst of scarlet billows up at you like the dancing ribbons signifying the fragrance. A feminine full on rush of powdery raspberry, rose, ginger, sandalwood and patchouli prance across the skin like the female heroine of the ad (Jessica Stam) tip toes mischievously across the Parisienne rooftops. 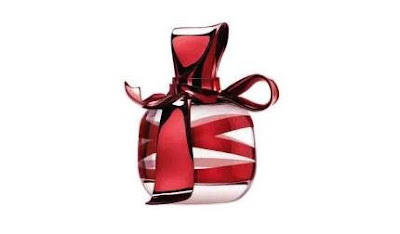 The ribbon that’s integral to the scent is no longer pinky purple but deep red (quelle surprise) and features on both the bottle and its box. Inspired by pop art, this very visual fragrance’s appeal is deigned for self confident women not afraid to dream or use their sensuality…in that way, this new incarnation has grown up but not too gracefully. Full of contrasts but never straying from its femininity, this limited edition fragrance is easy-to-wear. upbeat and a good choice floral chypre for Summer in the city. Ricci Ricci Dancing Ribbon has been developed by perfumers Aurelien Guichard and Jacques Huclier so it has a grand and weighty base. The aptly named ‘Beauty of the Night’ featured in the fragrance (from a flower that only releases its scent at night) is central to its make-up. Just like our heroine, it comes alive and is playful when dark…but not so mysterious as to be an enigma. Nina Ricci’s Limited Edition Dancing Ribbon is available from Debenhams and other good retailers at £41.50 for 50ml EDP. Next post: Keira Knightly in the new Coco Mademoiselle adv.